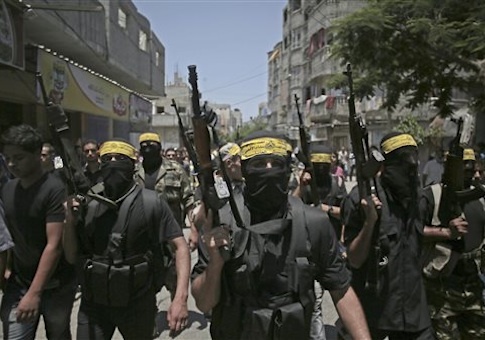 A top Iranian military commander confirmed that weapon shipments to the West Bank have already begun and that more will be sent to other "Palestinian resistance groups." "Arming the West Bank has started and weapons will be supplied to the people of this region," Brigadier General Mohammad Reza Naqdi, the commander of Iran’s volunteer Basij force told the state-run Fars News Agency on Wednesday. The military leader also confirmed what has long been suspected by Israeli intelligence agencies: That Iran is responsible for training and arming Hamas with highly advanced rockets that were used to penetrate deep into Israeli territory during the most recent conflict. Much of the arms Hamas deployed "were the products of the Islamic Republic of Iran," Fars reported Naqdi as saying. Iran is arming terrorists in the more moderate West Bank of Israel—as opposed to the Hamas-run Gaza Strip—because attacks on Israel from this area will ensure "the annihilation of the Zionist regime." "The Zionists should know that the next war won't be confined to the present borders and the Mujahedeen will push them back," Naqdi said. An Iranian General this week vowed to launch a surprise attack on Israel in retaliation for an Israeli drone that was reportedly shot down near an Iranian nuclear site. Anger at the incident has also prompted Tehran to step up its military support for Palestinian terrorists. "We will accelerate arming the West Bank and we think that we are entitled to give any response (to the recent aggression) which we deem appropriate," Brigadier General Amir Ali Hajizadeh, commander of Iran’s Revolutionary Guards Corps’ (IRGC) Aerospace Force, was quoted as saying on Monday. Iran also is considering military force, according to Hajizadeh. The IRGC claims to have shot down the Israeli drone with a surface to air missile. It lashed out at Israel in vitriolic terms in a statement issued earlier in the week. "This mischievous attempt once again made the adventurous nature of the Zionist regime more evident and added another black page to the dark record of this fake and warmongering regime, which is full of crimes and wickedness," the IRGC said in its statement. Iran has been promising to arm Palestinian terrorist for weeks as the most recent conflict between Israel and Hamas escalated. "The West Bank must be armed like Gaza," Iranian Supreme Leader Ayatollah Ali Khamenei said in late July. He echoed these comments on Twitter. Iran also has boasted of its past arming of Hamas terrorists. "Today, the fighters in Gaza have good capabilities and can meet their own needs for weapons," an Iranian lawmaker reportedly stated on television in July. "But once upon a time, they needed the arms manufacture know-how and we gave it to them." This entry was posted in National Security and tagged Hamas, Iran. Bookmark the permalink.